Good golly we need this book right now. 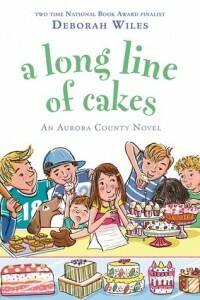 The Ford Econoline van pulled into the dusty driveway and a fast-moving line of Cakes tumbled out. They are a family on the move, a family that comes where it is called. This time they have been called to Halleluia, Mississippi, a town of 400 souls, otherwise known to millions of readers as Aurora County. Yes, we are back in the land where Ruby Lavender roams and Melba Jane squabbles and Miss Eula brings order, calm, love, wisdom and reassurance to all. The Cakes set right to work putting their industrial strength kitchen to rights. The Cake brothers are delighted to spot a ball field just next door and a troop of ballplayers magically appearing armed with gloves, hats and friendship. Their sister, Emma Cake, spots a girl from her safe place by the window. But should Emma risk friendship one more time? Emma has really had enough moving. She's left friend after friend after friend, all carefully recorded in her Friends Atlas. She wants this place to be home and she wants roots and she wants friends she can count on and who can count on her. This moving over and over again is just too hard. Just like the cake batter that the Cake family will whip up every morning at 4:00am, this story is filled with fruits, nuts, and that special Deborah Wiles ingredient that makes it sublime. This is warmth. This is comfort food by the page turn. Stuffed with delightful honesty, with familiar characters whose personalities resonate with human foibles, with tantalizing cakes that make you want to dust off that old cookbook and make your own mouth-watering concoction, the story centers on Emma Cake and her new friend Ruby and just how essential it is for all of us to have good friend. The two girls decide on a plan to keep Emma from ever having to leave this town. Meanwhile young un's, male and female alike, discover a great love of tutus, four dogs ...no, make that five..I was forgetting Eudora Welty... enjoy their best days ever and young Ben Cake has to fend off a persistent female named Finesse...who has none. Leo and Arlouin Cake, the parents and leaders of this beloved band, will be faced with a heart-stopping decision. All in all and "for pity's sake," love reigns supreme, life is better than good, and friendship, kindness and family leap off the pages like a big brass band. For those who love a good romp, some fantastic wordplay, sunshine and above all....Cakes.